The course of the following considerations was determined by a suggestion arising from a somewhat remote department of the physiology of the senses. Josef Breuer was the first to put forward the suggestion (in 1874), which was later fully established, that the otolith apparatus of the lower animals does not serve the function of hearing, as was formerly supposed, but the perception of the movement and position of the body relative to its environment and orientation in space.1 Earlier still it had been observed that certain crustaceans, whose otocysts open to the exterior through a crack and contain small foreign bodies as otoliths, lose these together with the shell at every moult, after which they introduce new ones, being quite indifferent to what material is offered to them for the purpose. The creatures feel around eagerly on the floor of the aquarium with their claws and fill the otocysts with grains of sand or the like, which they have picked up. With the intention of settling the question, beyond all dispute, of the function of these organs, the otocysts (or statocysts as they have been more correctly named since then), the Viennese physiologist, A. Kreidl, following a suggestion of Exner, induced the crustacean Palæmon to take up iron-dust into its statocysts.2 So statoliths were formed which were subject to magnetic influence. When he approached such an animal with a strong electromagnet from the dorsal side, the statoliths were lifted up on to the dorsal wall of the statocysts, thereby taking up the same position as they would occupy in a normal animal which had fallen on its back. Just like such an animal, accordingly, the crustacean which had been magnetised turned itself over and remained lying on its back, for when it was in this position the statoliths occupied their normal place. About the same time it was established that crustaceans possess no means whatever of hearing. These famous experiments in the physiology of the senses at first sight seemed to be a model specially suitable for didactic purposes, without further significance, in representing plastically the processes concerned in primary identification and certain characteristics of the relations between ego and external world in the early stages of mental development which are difficult to represent. As we said, these crustaceans strive eagerly after moulting to fill their statocysts as quickly as possible with suitable material; a small piece of the external world is made into an integral part of an organ, a part which is essential for the purpose of completing a predetermined structure, of establishing it and making it able to 1 2 Breuer, ‘Ueber die Funktion der Bogengänge des Ohrlabyrinthes’, Medizinisches Jahrbuch, 1874, S. 44. Kreidl, ‘Weitere Beiträge zur Physiologie des Ohrlabyrinthes (II. Mittheilung), Versuche an Krebsen’, Sitzungsber d. Kais. Akad. d. Wiss. in Wien, Mathem.-natur. Classe, Bd. CII. function. A piece of the external world, without undergoing any elaboration to change it, has to be incorporated into a special place in the organism in order that an apparatus of very central importance for the orientation of the individual in the world, and for the regulation of relationships with it, may become capable of fulfilling its task. Any material whatever is accepted by the animal provided that it fulfils certain conditions of form and consistency. Housed within the statocysts it now represents— pars pro toto —the external world inside the organism and helps it to regulate the relations of the individual to the whole of the rest of the external world (or at least to an important aspect of it). By means of a cunning modification the scientist’s experiment accentuated in particular one factor in this natural situation, that of energy: should the piece of the external world which is picked up (introjected) be of a special kind, namely magnetizable, the animal thereby remains ‘at the call’ of the magnet, if one may say so, until its next moult. But, unperceived by us, the whole process, which was approached at first without any ulterior intention, seized our interest much more intensively; and the modest rôle of a superficial aid in the representation of completely disparate processes no longer seemed adequate for it, it seemed rather to demand a detailed comparative consideration. But something more than a chance analogy would be necessary in order to establish such a view. There would have to be a probability of a deeper relationship between the two processes, to serve as a basis for the proposed comparison. But this basis is in fact given by the circumstance that the organs of the sense of equilibrium and orientation in space, which are included in the vestibular apparatus, and the organ of auditory perception are very closely associated with each other in that (1) they originate both phylogenetically and embryologically in a single tissue and (2) they remain anatomically and functionally closely bound together—the eighth cranial nerve provides for the conveyance of the stimuli from both sensory regions. In order to denote shortly the two regions which are to be compared, we shall speak of them in what follows as ‘the sphere of the spatial sense’ and ‘the auditory sphere’. We shall use the term ‘sphere’ to include not only the whole apparatus in all its portions from the periphery to the centre, but also the part of the psychical structure to which the actual sensory apparatus is subordinated and which provides for the further elaboration of incoming perceptions. To enter into problems of a physiological and a psychological nature connected with the sphere of the spatial sense is not necessary for the present discussion. With regard to the function of hearing a recent and comprehensive study of this sphere by W. Börnstein3 has led to the conclusion that in the case of human beings the physiological conditions in the primary auditory centre indicate that the hearing of ordered noises, particularly therefore those of speech, is of incomparably greater biological importance than the other developmental tendency, that, namely, towards hearing the pitch of notes and music. One fully agrees with this view when one considers the rôle of speech in reference to both the 3 Der Aufbau der Funktionen in der Hörsphäre, 1930. building up of the ego, and the comprehension and ordering of impressions of the surrounding world, and as a means of understanding between men. In the present-day theory of the ontogenetic development of speech the supposition is fairly well established that the acquisition of speech depends on the condition that the material of speech should be presented to the child from the outside and that no really creative factor is operative in the acquisition of speech by the individual. And therefore, in the case of a child with its sensory apparatus intact, the supply of very specific material to the auditory sphere is a very important and essential condition for the establishing of the ability to speak. We are not going to deal here with all the difficult and disputed fundamental questions of the psychology of speech, but shall be satisfied with the statement that what we are concerned with here is the assimilation and correct combination of verbal images, the development of a grammatical and logical order in the processes of speech and thought— all of which for our present purpose may be attributed to the auditory sphere. Accordingly we have to ascribe to the auditory sphere a part which has hardly anything to do with the function of hearing in the narrow sense, but which we must regard as having arisen in connection with the acoustic sensory apparatus. The function of this part is the development of a grammatical, syntactic and logical framework for the function of speech and thought and for the development of the function of judgement. R. Woltereck writes4: ‘Apart from the fact that speech is essential as a means of communicating experiences, it has indeed a directive function for our cognition in two senses. It furthers and directs our cognitive activities because it contains within its verbal structures and forms of sentences a precipitate of the collective forms of thought of mankind which everyone of us employs and elaborates further. And it exercises a very important influence by means of inhibitions upon the deeper probing of our cognitive activities, since it fastens our thinking to precisely these forms of sentences and transmitted forms of words.’ It follows from this that the auditory sphere is one of the most important apparatuses for the regulation of relations with the environment and with the introjected representations of interests in that environment, an arrangement absolutely specific for the human species. Research on the brain also seems to furnish indirect evidence of this, since it establishes that it is in the region of the radiations of the auditory tract that the cyto-architectonic formation of the cerebral cortex shows the relatively greatest difference between men and the anthropoids in the building-up of the layers. There is much to be said for the view that at earlier stages of development a close connection exists between the linguistic and logical concept ‘right—wrong’ (‘correct— incorrect’) on the one hand and the moral concept ‘right—wrong’ (‘good—bad’) on the 4 Grundzüge einer allgemeinen Biologie, 1932. other. Certainly this fact has a great deal to do with the way in which education in speech takes place, but even so it is worthy of note that the linguistic branch of education cannot be thought of as isolated from the rest. Moreover it is probable that the function of judgement in its beginnings is to be conceived of as a single unit in judging processes both in the external world and in the internal world, and that consequently these two differently directed parts of the function are not easy to separate. The problem of reality-testing is closely bound up with this. Freud, as we know, first ascribed reality-testing to the super-ego, but later (in The Ego and the Id) decided upon a correction, assigning it to the ego as its specific task, in accordance with the relations of the ego to the world of perception. On the other hand there is good reason to ascribe to the super-ego function something of the character of perception, when one considers that the ego can take itself as an object, in self-observation, which is indisputably a super-ego function. It is this which seems to speak for the view that at least in an early stage in the development of the ego the function of reality-testing can hardly be separated off sharply from the function which has to judge the individual’s own methods of behaviour as ‘correct or incorrect’ and ‘right or wrong’. Let us return to our starting-point, the comparison of the crustaceans and their static organ with the process of introjection in man. By using this phylogenetic example would it not be possible to obtain more than a metaphorical representation of primary incorporation and its results? 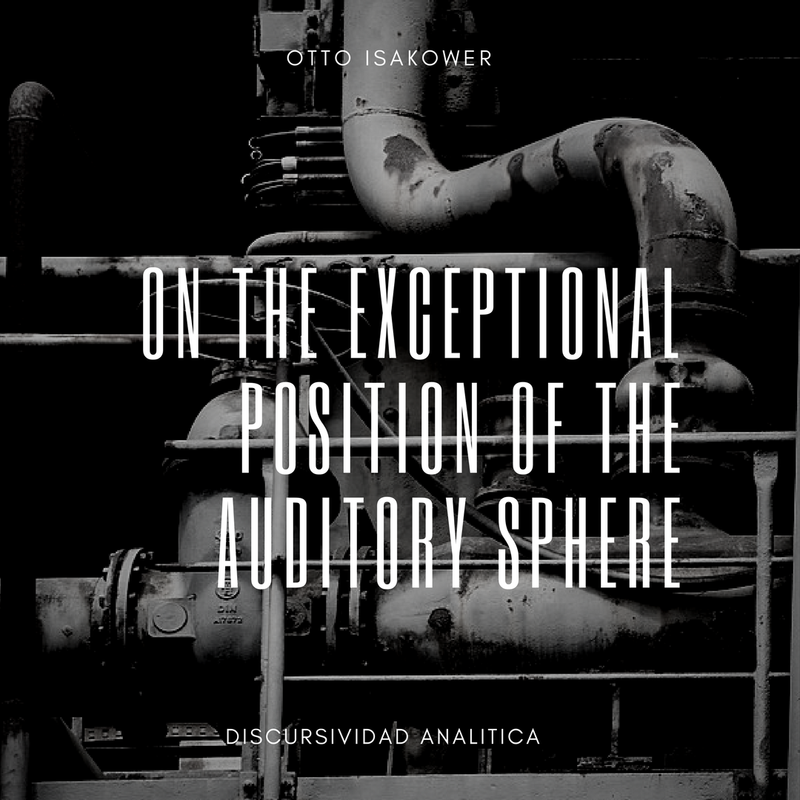 We believe that we have proved that it is probable that in the psychical structure also there are indications that the auditory sphere occupies an exceptional position, which makes it of much greater importance in its central portions than the corresponding portions of the other sensory spheres. On the other hand the question for us here is to show that the auditory sphere, as the phylogenetic descendant of the static apparatus, still has quite clearly very much in common with the organ of equilibrium,5 provided one accepts it as true that the super-ego functions like a psychical organ of equilibrium, and that differentiation of speech is indispensibly necessary for this. In order that the child shall handle speech as a tool, and as a result of doing so, the auditory sphere itself is fundamentally altered in a sense full of potentialities. The comparative view seems to make possible a clearer working out of an ego-apparatus than has been the case previously; and in particular an ego-apparatus which renders possible the mechanism of primary identification and represents the predetermined structure, which has itself to be enriched and further built up with the help of the components (objects) that are to be introjected. If we may recall once more the facts concerning the crustaceans, it looks exactly as though in both cases—in the integration of 5 Cf. Schilder, ‘Ueber Gleichgewichtsstörungen’, Jahrbuch für Psychiatrie, Bd. 45, 1927. the static organ in the crustacean and in the development of the ego-apparatus in man (i.e. the human auditory sphere)—one and the same fundamental idea has been applied for the solution of a problem of organization, which in the second case however is pregnant with results of incomparably greater importance. It is self-evident that experiences and impressions of the environment are necessary in order that a super-ego may be built up. It is just as self-evident that these experiences and impressions are acquired by way of sense perception. But can one imagine that purely optical sense-impressions, for example, by themselves and without showing any linguistically ordered structure, could possibly lead to the building up of a function of logical or ethical judgement? Without further discussion this question can certainly be answered in the negative. But the claim of the auditory sphere to the primary place in the building up of the super-ego would be thereby established. Nothing now stands in the way of the idea that this capacity for developing a super-ego, which is peculiar to man, must have been laid down in advance in what one might call the ground-plan of the psychical structure, and, indeed, this finds support in all that we believe we know about the earliest stage of man’s psychical development. And if there is any sense at all in speaking of preliminary stages of super-ego formation, one would most easily imagine such a thing in the form of a specially modified region of the auditory sphere. Further, one would presumably have to picture this modification as being built up in temporally successive stages. The first of these stages would then consist, perhaps, in the biologically determined inborn differentiation of the organic substratum, that is to say of a particular region of the cerebral cortex, which differentiation alone makes possible the acquisition of speech; the attainment of the next stage would be dependent upon speech having in fact been placed at the disposal of this substratum by the environment. For we know that the child is not capable by itself of constructing new words, to say nothing of a language, but that he has to build up his speech from linguistic material which is presented to him ready made. But this very fact sets in motion the process of developing an observing and criticizing institution. The following formula then suggests itself: just as the nucleus of the ego is the body-ego,6 so the human auditory sphere, as modified in the direction of a capacity for language, is to be regarded as the nucleus of the super-ego. Just as the statement ‘the nucleus of the ego is the body-ego’ has not merely a genetic significance, but is also fully valid for the finished structure, so the assertion ‘the nucleus of the super-ego is the auditory sphere’ must also be confirmed in the fact that this aspect of the super-ego comes to light in certain circumstances. As the classical evidence for this we 6 Freud, The Ego and the Id, p. 31. may bring forward the phenomenon which Freud referred to as the one which first suggested the conception of the super-ego to him: namely, delusions of observation. An essential element in these are alarming experiences in the realm of hearing: a keen awareness of cadences in the speech of the people around, an importing of deeper meaning into what is heard, falsifications of auditory perception and finally auditory hallucinations. The hallucinatory voices serve the purpose, among other things, of warning the sick person of the danger of being overpowered by the id. When the integrity of the personality is threatened from within, the super-ego reveals both its history and its genesis, that is, it reveals not only the way in which its nucleus arose but also of what its nucleus consists. A somewhat different picture, but the same thing fundamentally, is well shown in the following single observation in the case of a schizophrenic, in whom an impoverishment and blunting of the inner life dominated the scene. The patient, a man about twenty-six years’ old, complained of attacks of physical incapacity to work, so that he had to lay aside whatever he held in his hands, and he also felt a heavy pressure down upon the top of his head. (No epilepsy was present.) At the same time something else always happened which the patient called ‘self-talking’ [‘Selbstredung’]; he was obliged to repeat aloud over and over: ‘I am Max Koch from Alland’ (which in fact he was). In a critical situation, when a threatened disruption of the ego was, as it were, acutely experienced, being condensed into a moment, this ego affirmed its existence by a magic formula, which can easily be understood as a faithful reproduction of what had been instilled into him as a child. As is well known, the perception by the self of a threatened loss of reality is shown very strikingly in the catastrophe of an epileptic attack. A patient of Kinnear Wilson’s described his auditory aura in the words: ‘I seem to hear everything that has ever been said to me in all my life.’ The disturbance in the balance of the psychical structure in situations of sudden danger to life also sometimes affords a deeper insight into the nature of this structure. One may perhaps be permitted to quote a personal reminiscence of Freud’s: ‘I remember that I have twice felt myself in danger of my life and each time the perception came quite suddenly. In both cases I thought to myself “Now it’s all up with you”, and, although my internal speech is as a rule carried on with quite indistinct sound-images and only faint sensations in the lips, yet in the moment of danger I heard these words as though someone were shouting them in my ear and saw them at the same time as though they were printed on a fluttering piece of paper.’7. The super-ego character of these words is to be remarked, which sound like the pronouncement of judgement by a powerful authority, while at the same time the verdict can be read. We must also observe the displacement outwards in double form (in 7 Freud, Zur Auffassung der Aphasien, Vienna, 1891. speech and writing). One could also conceive of the externalization as being the result of a narrowing of the personality to the body-ego as a consequence of the shock. From this point an approach is also opened up, perhaps, to deeper research into the position of the auditory sphere in dreams, which is still so problematical and which, since the elaboration of the theory of agrammatism, has met with renewed and growing interest in the investigation of aphasia as well as elsewhere. It should only be briefly pointed out here that the fact discovered by Freud that the dream is not in a position (or is only in an inadequate one) to give expression to grammatical and logical connections (naturally this does not refer to speeches inside dreams) finds a surprisingly exact analogy in certain kinds of aphasic agrammatisms. A further contribution to the subject is supplied by the observation that linguistic phenomena connected with going to sleep often show an almost exaggeratedly elaborate grammatical and syntactic structure. The speech flows along in complex phrases, with strongly accentuated sentences of animated and changing form; but it loses its clarity more and more as it proceeds, and at length there remains only an impression of lively and complicated periods without any verbal elements which can be clearly grasped (and this is perhaps one of the main reasons why the periods themselves are so difficult, indeed almost completely impossible, to grasp) until at last the periods gradually pass over into a scarcely articulated murmur, which stops, starts again, and finally passes over into sleep. One might say that going to sleep itself is a case of ‘crossing the frontiers of speech’: the ego behaves just as though, in obedience to an order from the customs officials, it was obliged to leave behind its linguistic belongings. Although this flaring-up of linguistic activity (partly of an auditory and partly of a motor kind) appears at first sight like an enrichment, it nevertheless ends in an impoverishment; it gives the impression of a copious inflow and is nevertheless a flowing out, a bright flickering-up of the auditory sphere before it is completely extinguished. Perhaps all this is only another aspect of the fact that before the ‘censor’, whom we know so well, withdraws, he seizes the opportunity of making his voice heard once more very forcibly. What we see here is not so much content that is characteristic of the super-ego but almost exclusively the tone and shape of a well-organized grammatical structure, which is the feature which we believe should be ascribed to the super-ego. At the moment of waking up, the linguistic auditory phenomena present themselves in a much briefer and more succinct form. It often happens in this way that a word or short sentence still reaches a dreamer, while he is waking up, like a call, and this call has very often a super-ego tinge, sometimes threatening, sometimes criticizing—words for which the dreamer, as he wakes up, feels an inexplicable respect, although they are very often a quite unintelligible jargon. It would be a valuable support to what has been brought forward here, if we could show that what we have said is nothing more than a further elaboration of what Freud meant when he replaced his first graphic representation of the structure of the mind by another. In the first of these two sketches, made in 1923, in The Ego and the Id (p. 29), the ego has on one side ‘an auditory lobe’ [‘Hörkappe’, literally, ‘cap of hearing’] ‘worn crooked’. In the repetition of this sketch, which appeared in 1933 in his New Introductory Lectures (p. 105) and which in other respects is practically unaltered, this ‘auditory lobe’ is no longer to be seen. The corresponding position is now occupied by the super-ego.